There's a bear up there! Last night at dinner time we heard knocking at the door. 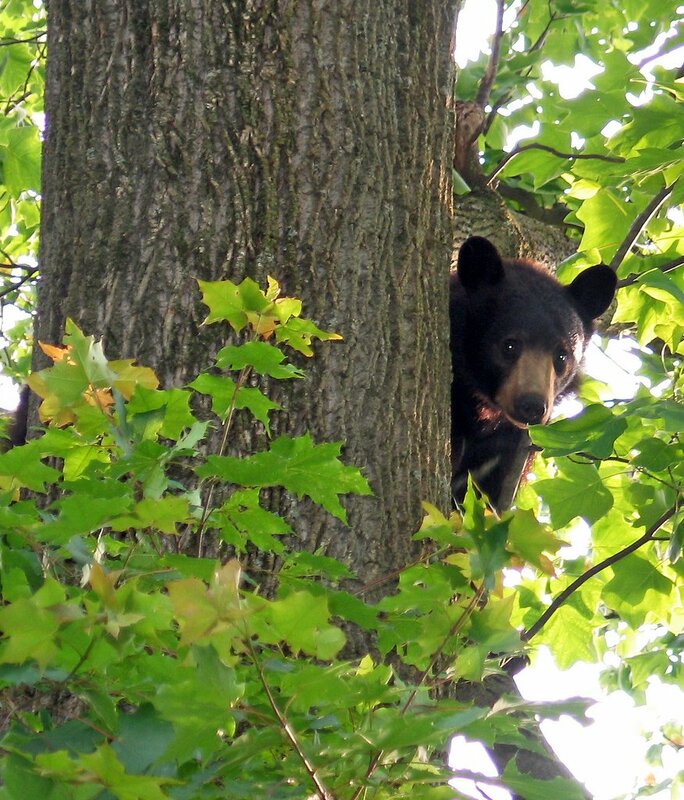 It was our neighbor, come to tell us they had a bear in their tree. We all rushed over, and there he was! There are many in the area, but we live right on main street so it seems a little more unusual. I'm not sure if they called us just so our girls could get a look (they weren't that interested) or because my husband writes the nature column for the local newspaper and they wanted to get mentioned! Thank you for the welcome note. your girls "wern't that interested"!!! Its a bear for goodness sake!! lol. Its funny but you said how you are getting a feel for Newcastle,well my feel for your town is of all those 'nice' films that take place in small town America(which I enjoy btw!)--lovely. I think Newcastle has a population of about 300,000 I think.So not huge but the city centre is actually very small. Surly they called you because of your world wide reputation as the publisher of Sharon DP ... We also have experienced a problem with bears in populated areas ... It can be very dangerous. Holy cow! He looks cute. Wow! Great shot. Yeah, he looks cute, until he starts disemboweling you with those claws. Bears are creatures I really don't want to get too close to! That is a wonderful shot!!! Amazing! Beautiful pic! I remember I met some in the Shenandoha National Park... But in built-up Connecticut this is amazing, isn't this? Aw, what a cute one! It would be a sensation over here. Actually we had a bear in the alps recently who caused quite some excitement. is it common to have bears so close to peoples homes? That would seem scary to me since small bears like that must have a mommy bear nearby twice as large and half as amused by human trampling too close to its pup. Well, I promised to have a look at your blog. Your shot is really amazing and full of interest. As some ohters, I wonder how humans and wild creatures of this kind can live together in peace. Your experience needs to be shared with my conterparts.